There might only be 650 of them but working out which MP is which can be a challenge when they get in touch out of the blue. Labour MP Peter Kyle has told friends he received a barrage of text messages last weekend from across the House from MPs interested to hear more about his expected amendment to the Brexit – which calls for a second referendum. But some of those who got in touch on unknown numbers only identified themselves by their first names. It left the ever-polite Kyle scrabbling to work out who was who without offending anybody. MPs were bemused to be met with responses such as ‘how is the weather up there?’ and ‘how are things going in the local party’ as the Hove MP used a process of elimination to deduce who was who. Speaker John Bercow raised eyebrows this week when he threw a grenade into the Brexit process by blocking Theresa May from holding a third so-called ‘meaningful vote’ on her deal. Citing ancient parliamentary convention – of course – he said one of his reasons was to prevent the Commons from wasting time. In exactly that spirit, Bercow was his pithy self as he explained the reasoning to the House. “It would be true to say that a concern with the judicious use of parliamentary time, when that time is finite, and the avoidance of its wastage, is an important factor,” he said. The Financial Times this week revealed that the Speaker talks like that after reading too many Jane Austen novels in his 20s. Stands to reason. Tory MP Michael Fabricant has got himself into hot water after making a drinking slur on WhatsApp at colleague Antoinette Sandbach. The Sun revealed that in response to her attack on ERG MPs, Fabbers shot back: “If you’ve been drinking again, best not to be on social media – even this one. 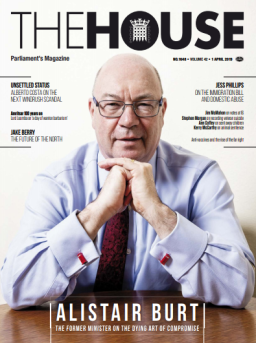 OK?” The House magazine this week reveals Sandbach has submitted a formal complaint to Conservative HQ. Sometimes it really is best not to be on social media, drinks or no drinks.